As a young man, Dan Arena never thought powerboat racing would turn into a prosperous and prestigious career. In fact, growing up in Oakland along the beautiful Lake Merrit which the city surrounded, Arena took up outboard racing just for fun. He went on to race inboards because he wanted a new challenge and more speed. And when Lou Fageol started a series of Gold Cup class races on the west coast, Arena went to work in Sam Baxter's garage and helped Sam Kuntz build then race the Baxter Special on the Salton Sea against Fageol and his boat So Long. The year was 1935 and Arena had just turned 19. He stayed with boat racing for the next few years, waiting for the opportune time to step into his father's winery business. But in '36, the Baxter Special which was renamed Miss Golden Gate to help publicize his father's winery, did not lose a heat of racing, winning everything including the most prestigious trophy on the coast  the Pacific Motorboat Trophy in Newport Beach. The big wins in racing led Arena to collaborate on a new boat for the following year. His Miss Golden Gate had already reached a performance level almost equal to that of the best time of three-time Gold Cup Champion El Lagarto. Arena was now thinking about stepping up to the big time, and he came to Detroit for the first time in 1937 without a ride just to scout the powerful unlimited class of racing. He watched as Herb Mendelson's Notre Dame tore apart the El Lagarto by nearly ten miles per hour in each heat. 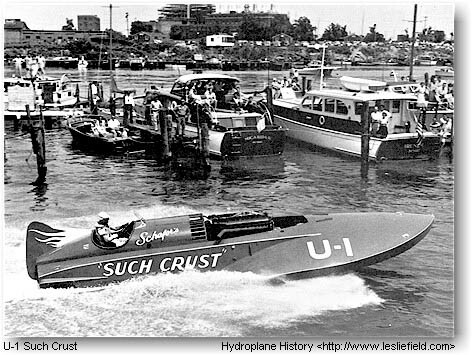 The Duesenberg powered Notre Dame impressed Arena and he went back to the coast to defend his Pacific Motorboat Trophy. He knew the Miss Golden Gate was too slow to catch the boats now being raced in the east, so he and A.E. McLean built a new Miss Golden Gate. This was a three-point design and not a step design as the old Golden Gate. The crew worked on a shoestring budget and in a Cinderella Story, the low budget Miss Golden Gate completed all 90 miles of the '38 Gold Cup race, placing second to the Alagi driven by Count Theo Rossi, but becoming the toast of the city. In fact, the Golden Gate's throttle became dislodged and riding mechanic Danny Foster had to lean outside the boat to keep it going. After the 1939 season ended, Arena gave up boat racing, heading for a career into the winery business. But the only "whine" Arena would be a part of would be the whine from the engines of powerboats. He had already sold his Miss Golden Gate to Stan Dollar. But when Clell Perry and Mendelson and a parting of the ways, suddenly Arena found himself installed as the driver for the Notre Dame at only 22 years of age. This team had won three of six races from 1935 to 1937 before sitting out 1938 due to a crash of the Notre Dame. This same boat was Arenas mount for 1939. Unfortunately the Notre Dame was difficult to steer, having a bucking motion which made it a challenge to drive. Nevertheless Arena took second in the Gold Cup, posting a lap time within four m.p.h. of the winning My Sin. At the President's Cup, the boat was further refined due to the efforts of Arena and famed designer John Hacker. He took another second overall, although winning a heat and posting a lap time the equal of the victorious Miss Canada III. In spite of the encouraging results at Washington, a new boat was planned for the Notre Dame team for 1940. It was to be designed by the 23-year-old Arena as opposed to Arno Apel, Douglas Van Patten or John Hacker. This was a tremendous vote of confidence by Mendelson as this was to be Arena's first attempt at designing a Gold Cup boat entirely by himself. It was the thrill of a lifetime for the young Arena, who was in the employ of the multi-millionaire Mendelson, who was closely associated with General Motors. At the time Arena built the third Notre Dame in 1940, he not only had the considerable financial resources of Mendelson at his disposal, but also the research facilities of General Motors which provided the best of answers to his questions as well as materials. The new Notre Dame was a step hydro although designer Arena preferred the three pointers. Mendelson's previous boats had been of the step design with the first Notre Dame sweeping the 1937 season. The new boat was quick in its first trials in posting a straightaway speed of 98 m.p.h.  the record for the Gold Cup class being held by Lou Fageol's So Long at 97 m.p.h. However the new Mendelson entry had steering problems and failed to win the 1940 Gold Cup at New York in August. 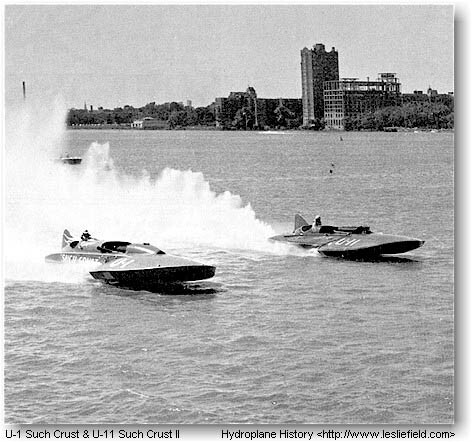 Once these steering problems were overcome, Notre Dame gave one of the most remarkable performances in the history of motorboat racing by raising the 15 mile heat record for Gold Cup boats by 10 m.p.h. at Red Bank, beating his nearest opposition by nine m.p.h. The second place boat was the 225 class Tops 111, which had embarrassed the 1939 Gold Cup champion My Sin by running head to head with the latter on Lake Hopatcong. The Notre Dame closed out her 1940 campaign in spectacular fashion by easily defeating the My Sin in all three heats to win the 1940 President's Cup. This was not the end of the honors to be secured by the new Arena design as in October 1940 the boat set a mile straightaway record of 100.987 m.p.h. at Detroit. A Gold Cup class boat had not exceeded the century mark before this run. Allied war effort. Arena became part of this effort by first working as a naval architect for the Navy Department and then as a commissioned officer, being involved with the U.S. Army Transportation Corps in the marine design section. However as the war drew to a conclusion, Dan came up with the design for a Gold Cup boat that would utilize the Allison engine that powered the P 38 fighter plane. The Miss Golden Gate III was completed in Berkeley California about a month before the September 1946 Detroit Gold Cup. Unfortunately at its first trial the bow of the boat was severely damaged when dropped by a crane. This necessitated around-the-clock repairs and as a result the new boat arrived in Detroit with almost no testing time. In the Gold Cup, the untrimmed Golden Gate proved second best to the winning Tempo VI until the final heat when she led the latter lap, after lap breaking the Gold Cup lap record on almost every round. When the boat, as Miss Great Lakes, swept the President's Cup against the same Tempo VI, it was clear that Allison power was the way to go. Shortly after the President's Cup, Dan Arena went to work for Lou Fageol's Twin Coach Company in the marine division. But before long he again got the call from Herb Mendelson to drive his Gold Cup class Notre Dame, which was still powered by a Duesenberg engine that gave up about 500 horsepower to the Allison-powered boats. This was 1947 and the Notre Dame, which had been a very smooth riding boat in 1940, was now a hard ride since it had been stored at a dock warehouse and the bottom had become warped. Nevertheless the Notre Dame posted the fastest heat and lap in the Gold Cup before winning the Silver Cup. However at the President's Cup it was apparent that the underpowered Notre Dame could not keep up with the aircraft-engined boats any longer. In 1948, Arena enjoyed perhaps his greatest season as he became involved with Jack Schafer and a new Ventnor three pointer named Such Crust. The boat was the Ventnor Boat Company's first design to accommodate an Allison engine and was immediately successful in winning two of four races including the President's Cup. The Such Crust was clearly the outstanding boat of 1948, but deferred to Tempo VI as High Point Champion. This was due to the fact that the Such Crust was registered as an Unlimited, while most of the other boats were registered as Gold Cuppers. As a result each class was scored separately with the unlimited class having an insufficient number of registered entries to justify a High Point Champion. The following year Arena started to get involved with the activity that was to be his profession for the rest of his life. That year he built and designed the Such Crust II and in 1950 he opened his boat shop and marina at Mt. 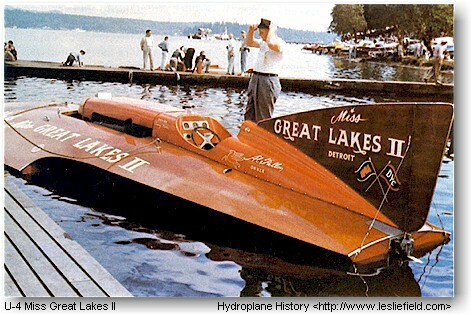 Clemens, Michigan, which produced such Gold Cup boats as Gale II, Miss Great Lakes II, and Miss U.S.. Still, Dan Arena set a new North American mile straightaway record in 1949 aboard Such Crust, besting Gar Wood's record by three miles per hour, and in 1950 he won the Steel Cup with Such Crust II, before posting his final victory at Miami in 1952 in the cockpit of the Miss Great Lakes II. Both the Gale II and Miss Great Lakes II, which were of an identical design, won races and showed an ability to run with the Slo-Mo-Shun boats, which set the standard at that time. But perhaps Dan Arena's greatest design was the Miss U.S., which also was competitive with the Slo-Mos as well as the all-conquering Tempo VII of 1955, but in addition in a later version built by Les Staudacher to an Arena design, was the first boat to record an official mile straightaway record of over 200 m.p.h. in 1962. To understand the significance of this accomplishment it should be remembered that two of the most outstanding boats of that era  the Hawaii Kai III and Miss Thriftway -could not come close to this mark over the mile straightaway. In addition, the Miss U.S. record run has now stood for over 25 years. Truly Dan Arena is a unique individual in the history of motorboat racing, since he has proved himself to be of Hall of Fame calibre both as a driver and as a designer. Only Gar Wood occupies a similar position. Dan became a member of the prestigious A.F:B.A. Honor Squadron in 1982. He has spent the last thirty years in Oakland as a builder and designer of pleasure boats.